Our men and women at the Sheriff's Office spend time interacting with various groups, organizations and people throughout our county on a regular basis. We want to be able to share pictures and stories on this page detailing some of those interactions. Hopefully this will be a way we can illustrate our partnerships throughout the county. One of the most recent projects we have been working on is to provide training for ideas of what to do if you find yourself in an active shooter situation. The course we offer specifically touches on active shooter events in the workplace, public and schools. It provides an in depth look at past events and teaches from those situations. Organizations who have requested training so far include Boone Memorial Hospital, Office of Mine Safety and Health Administration, Spruce River Volunteer Fire Department, Ball Chapel Church and the Boone County Schools Safety Team. A good deed by Boone County Sheriff's Office Sergeant Bill Browning leads to quite a bit of help for the less fortunate. Before Christmas, Browning received a call from a woman who was in need of clothing for her son. The family was in a tough spot and was looking for help. During his shift that night, Browning went shopping with his own money and purchased the young man a warm jacket and some other things to wear and delivered it to him. One of Browning's friends posted the good deed on Facebook. The post was shared hundreds of times and was literally spread around the world. The outpouring of support that came into the sheriff's office over the next few weeks was overwhelming. Sgt. 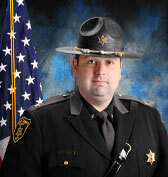 Browning was honored as WSAZ's Hometown hero shortly after the incident. The Master's Law Firm in Charleston West Virginia also contacted our office during this time. Workers there had held a clothing drive at their business and wanted to donate the items to the Boone County Sheriff's Office to be handed out to people who may be in need. The items collected were lightly used and of very good quality and were for adults and children alike. Partnering with the Master's Law Firm, we were able to help out several programs. A couple boxes of adult clothing was donated to Scott High School to keep on site and to be used as needed for their students. Also accepting several boxes of clothing was Tina Manns, with the YWCA Resolve Family Abuse Program. The YWCA operates shelters for abused family members and children when they are escaping volatile relationships. The remaining clothes were taken to the Madison Methodist Church and added to their clothing bank. The clothes made a nice addition to the program which hands out clothes to individuals in need. This is a great story of how a kind deed by one of our Deputies was able to develop into so much more. We appreciate all the support during the Holidays. Thanksgiving Week, the Boone County Sheriff's Office partnered with the Faculty at Madison Middle School to provide Thanksgiving Dinner to special families. The staff from Madison Middle School raised the funds and ordered the dinners. The meals were picked up from Kroger Deli and delivered to families by Boone County Sheriff's Deputies. What a great way to join together and make a difference!